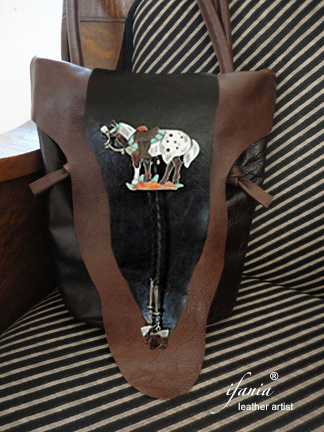 Luxurious black tundra sheep leather handbag. 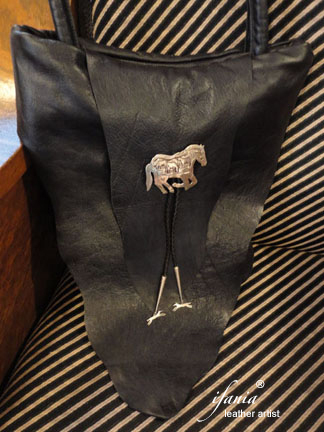 Stunning & rare sterling horse bolo by Santa Fe, N.M. sculptor Stan Bentall. Vintage 1986. Fully leather lined with large zippered interior pocket. Measures approx. 13 X 10 X 4"
Two-toned leather handbag in chestnut and midnight brown. Vintage Sterling inlaid horse bolo with saddle tips, signed Mahkee. Fully leather lined with one larger zippered interior pocket. Measures approx. 14 X 14 X 4"
Rich black leather bag. 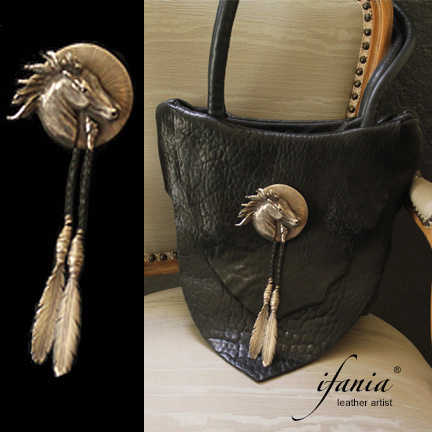 Coupled with Sterling Silver Storyteller horse bolo. Fully leather lined with one large zippered interior pocket. Measures approx. 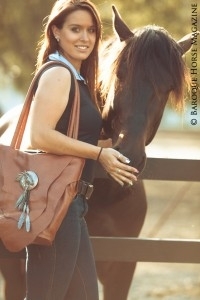 13 X 10 X 4"
Luxurious two-tone leather handbag in sable & midnight brown. 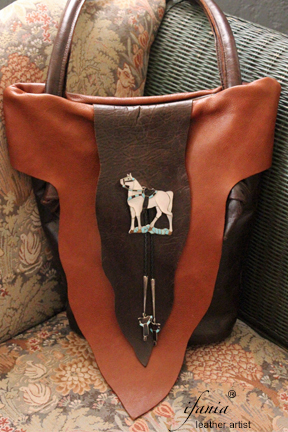 Coupled with sterling silver inlay bolo with matching horse tips by Joe Zunie. Fully leather lined with one large zippered interior pocket. Measures approx. 14 X 14 X 4"